RingMesh - Chainmail at Its Finest! What happens when you combine the versatility of cloth with the strength of steel? You get what we have originally coined as RingMesh. 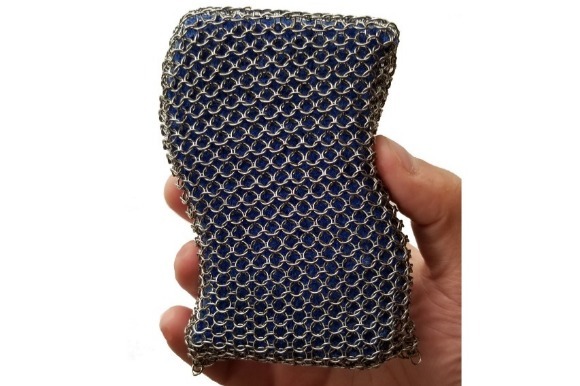 From stab and cut protection to historical reenactment all the way to modern curtains and lighting, RingMesh has brought chain mail to the 21st century. 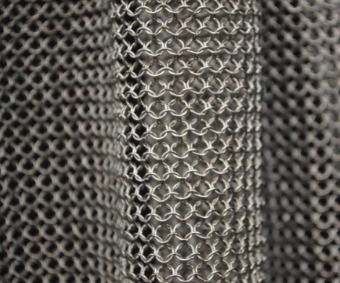 Established in 1979 and with almost 40 years of experience, we take pride in protecting all of our customers and making their RingMesh dreams come true. Contact us today and see what a great fit we can be! This sponge/soap pouch is great for cleaning pots and pans that have food baked on. Perfect for scrubbing Cast Iron cookware but can also be used on other bake ware. Made of 100% welded stainless steel, this scrubber combines the versatility of a sponge with the durability of RingMesh. Stainless steel also helps remove the scent of fish and onions from your hands when used after handling. Get it today for your kitchen and that perfect cleaning tool you've been looking for. The #SS210 is our most popular chainmail shirt! This item is extremely versatile, allowing you to wear it concealed under a shirt, with the peace of mind of wearing real cut and stab protection. Or you can show it off as the perfect accent to your favorite costume. It is dishwasher safe for easy cleaning and made from 100% welded 304 stainless steel. Our LT210 is the premium in chain mail attire. 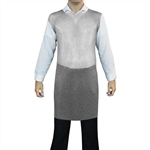 With the large weighing in at only 7lbs, it offers full upper body protection from cut and stabs wounds while allowing you to be able to wear it all day with little or no discomfort. Made out of 100% stainless steel welded rings, it is very easy to maintain and also very durable. "I purchased the RingMesh chainmail shirt about 2 years ago and it still looks the way it did the day I got it. NOT ONE ring is missing. I have worn it really hard and I must say it's the best purchase I've made in years. Bang for your buck it's just the best chain mail there is no contest." 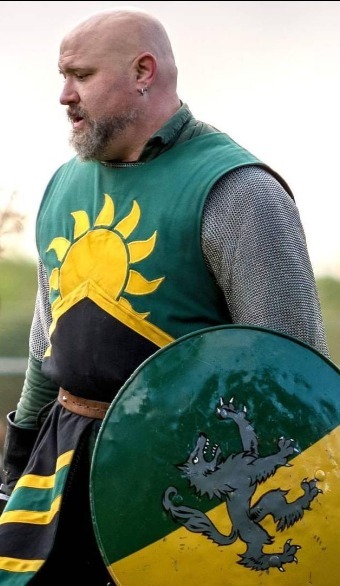 "I purchased this chain mail shirt for use at LARP over the course of a weekend. This suit is so light that I literally forget that I am wearing it! I went from not being accustomed to wearing any armor at all, to wearing this for a whole weekend with no discomfort whatsoever. This stuff is amazing!" Most popular RingMesh product! 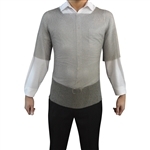 The standard chainmail shirt length with short sleeves provides protection for full torso and the upper arm. 100% welded stainless steel chain mail for stab and cut protection. 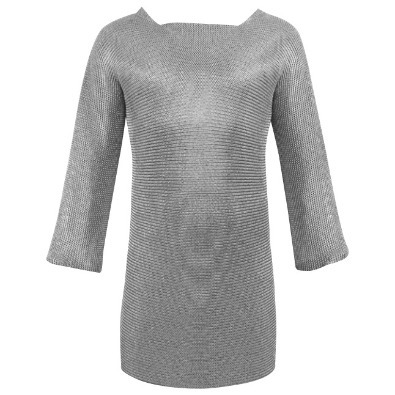 Chainmail Tunic Extended in Length for Full Protection of the Upper Body and Upper Legs. 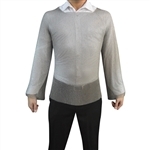 Standard Chainmail Shirt Length With Long Sleeves to allow for 100% protection of the entire torso as well as your arms. 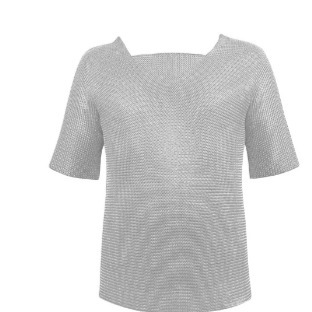 This chainmail shirt is made of 100% welded stainless steel chain mail for stab and cut protection. 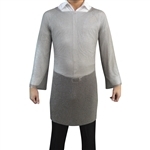 Chainmail Tunic Extended in Length for Full Protection of the Upper Body and Upper Legs as Well as Long Sleeves for Full Arm Protection.